The popular Universal Studios Theme Park in Hollywood, California opened in 1964. 25 years later, Universal Studios opened up a second theme park in Orlando, Florida, and eventually opened parks in Japan and Singapore. 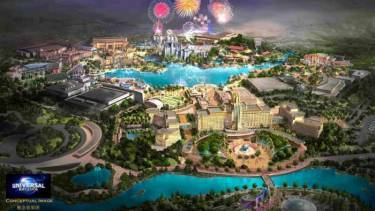 In 2014, it was announced that a Universal Park would be constructed in Beijing, China. It took some time to get construction underway, but the park is currently set to open in 2020. In early 2019, Portland Bolt manufactured 2,000 custom A490 Type 3 heavy hex bolts for the project. It was critical that Portland Bolt not only produced the bolts in a timely fashion but that all the certification documents were provided immediately in a closely scrutinized project. Additionally, our experience with the paperwork and shipping logistics involved with sending bolts internationally was essential in making sure there were no major delays getting the order shipped after it was completed. Portland Bolt’s experience in providing custom bolts for international projects proves that despite the geographical challenges, we can be a trusted option when you need your order to be done right and provided on time.